You have heard people saying that India is a land of Vedic religion, Hindu gods and goddesses, temples, saints and spirituality; which areall utter nonsense and totally propaganda. India is, in fact, truly a land of atheism, it is a land that gave birth to atheist religions, land of Shraman philosophy, the land of Jainism, Buddhism, Ajvakas, Ajanas and Charvakas;for thousands of years we believed that no creator created the universe, nor did we believe in Vedas. 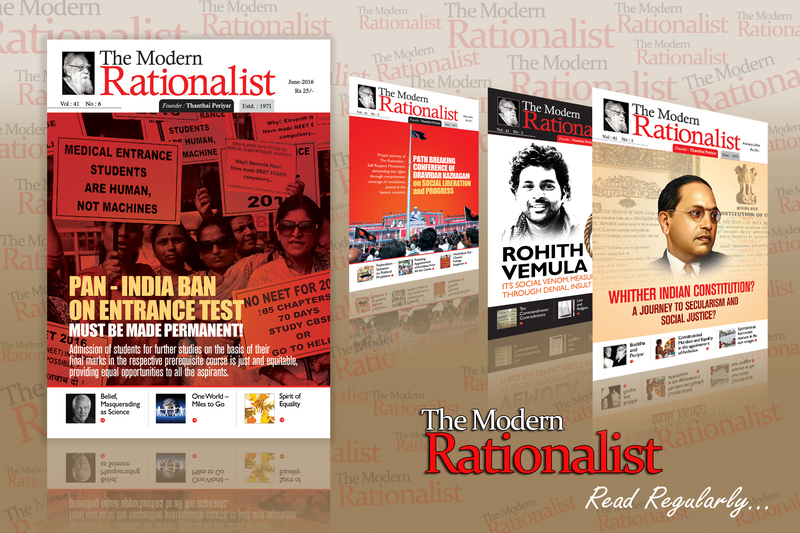 No other society in the world can boast of an atheist tradition longer than India. The atheist tradition of India goes as far back as 1500 BCE. Shraman religions are the only indigenous religions of India. Whether it is Vedic religions or any of the Abrahamic religions, they are not indigenous religions of India and they do not reflect the true character of India. Nowadays, we hear a lot of talk about bringing back the true India. If anyone wants to bring back the true India, it cannot be the Vedic India, it should be the Shraman India, the Godless India, the Nasthik India. Ladies and gentlemen, please note that there is subtle difference between atheism and nasthik; nasthik refers to non-acceptance of Vedas and the Sheraman schools did not accept Vedas. There is a very good reason why they did not. Vedic school of thought is the root cause of miseries of India. It divided the society, it took away the self-respect of people, it disfranchised vast number of men and women, and it degraded women. It is a shame that still it is dominant in the Indian society. Think for a minute why apartheid could be dismantled but the caste system could not be for thousands of years. There is law against racial discrimination in both U.S. and in South Africa today. Why there are no law prohibiting castes in India? It is the power of Vedas; it is the Vedic gods that created the segregation, the division among the people. Until we do away with Vedas, and Vedic religion, until we do away with gods, India has no hope of becoming a powerful nation in the world. The caste system has weakened it all. The Vedic religions have guttered India. The Shraman schools gave a tough opposition to the Vedic religions in the past and did an extraordinary job reforming India; but after 1200 BCE, the power of Shraman schools waned and the Vedic religions fully took over India again. Why did the Shraman religions that were so powerful at one time, declined and what do we learn from their decline? Of course, external aggression was a key factor but more important is to analyze the internal factors. The Mahayana sect of Buddhism, which was at its zenith at one time, was key in closing the Buddhism’s chapter in India. It flourished at one time but did so at the cost of compromising the core philosophy of Buddhism. They made Buddha a God and that made it easy for Vedic religions to merge in; Vedic religions made Buddha an avatar of Vishnu and closed Buddhism’s chapter in India. The lesson learnt is that it is good to be tolerant but not compromising in your core philosophy. It is important to acknowledge the fact that when Buddhism became a religion, it became a liability. Look what it did to the people of Rohingya Muslims in Myanmar, and what it did to the Tamils in Sri Lanka. It should be condemned unequivocally. It is extremely shameful that a peaceful philosophy, a rational philosophy, turned into a monster when it became a religion. The same thing with the Jains. Now they have reduced Jainism to doing Bhajans on Mahavir and almost merged it with Hinduism. Some of them became great supporters of Hindutva. What a shame that an atheistic religion that opposed Vedas tooth and nail, a religion that provided ethical framework for living without god has totally turned away from its tradition and its obligation to the society. I use this forum to call upon my Jain friends to review what they are doing to this country and to their religion when they support Hindutva. You cannot reduce Jainism to the support of cows along with Hindutva. Going back to the reasons why the Shraman schools failed, yet another fact is that they moved away from the common man, they became an intellectual group of monks and nuns, the same problem we face today among the western atheists. When Shraman schools moved away from common men, the Bhakti movement filled in the gap and completely took over the Indian masses and we pay a heavy price for that even today. History is a great teacher, we should learn from it. What we should not do is more important than what we should do. 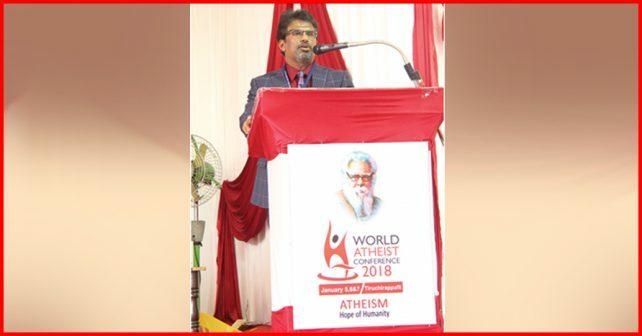 Dravidar Khazhgam, the custodian of the Dravidian movement, the co-sponsors of this conference, is in a way the continuation of the true Shraman tradition of atheism, opposition to Vedic religions, supporters of women’s emancipation, rational thinking and anti-caste. The Dravidian movement is a populace movement; it is perhaps the only atheist movement in the world with large following; following of the common men and women. The success of the movement is due to its nature of being a multifaceted social movement. I would call Periyar’s atheism as ‘applied atheism’. It benefited people from all walks of life, it brought self-respect to the people who were deprived of it, it made it possible for the deprived classes to get education, it helped to achieve gender equality, it is helping to eradicate caste, and instill rationalism among common men and woman. Infact, it enriches human life from birth to death. At last the atheists have learnt to become a part of the mass without compromising its core tenant. Dravidian movement is not a regional movement, it is not meant for any particular linguistic group, or for a particular social group, it is a universal philosophy, it is for the welfare of the whole of humanity. It is true that it started in Tamil Nadu; now it is spreading from the south to the whole of India and beyond. One day it will engulf the whole of India, that day is the day when Manu dharma, the Vedic philosophy will die out in triumph of egalitarian society; a society that is advanced and can be respected by the rest of the world. Dravidian philosophy is the only alternative to Hindutva. Indians has to pick between a Hindutva philosophy, a decadent philosophy based on Vedic traditions, inherently based on hate, based on segregation, a philosophy that denies you the self respect, our human rights, that segregates you according to the varna, boxes you in a caste, judges you according to your caste, punishes you according to your caste, and makes you believe in irrationality; or the other alternative is the Dravidian philosophy that is inherently based on love of fellow men and women, believes in no caste or any kind of segregation, you will be judged only by the content of your character, and rationality will be your way of life. You will have self-respect and no one can obstruct your life, your liberty or your pursuit of happiness. It is our solemn duty to spread the Dravidian philosophy to the nook and corner of India and then to the whole world.